After getting its start as a stand at the Pearl Alley Market, Si Señor moved to a small counter-only storefront in the Atlas Building and then one door down to their current location in the same building. It’s not all sandwiches however. Si Señor also offers other Peruvian specialties. Most noteworthy, on Saturdays—and Saturdays only—you can get their amazing ceviche. For the uninitiated, ceviche is raw fish that has been “cooked” in citrus juices. If there is a national dish in Peru, it’s probably ceviche. Si Señor’s version is a shining example of the dish done well. Their ceviche is light and refreshing, and I’m having a hard time describing the flavors as anything other than crisp and bright. The texture of the fish is as it should be as well: firm on the outside and tender inside. The way ceviche is made, the acid in the lime juice denatures the proteins in the fish, resulting in a texture that is more akin to a cooked fish than it is to sushi. 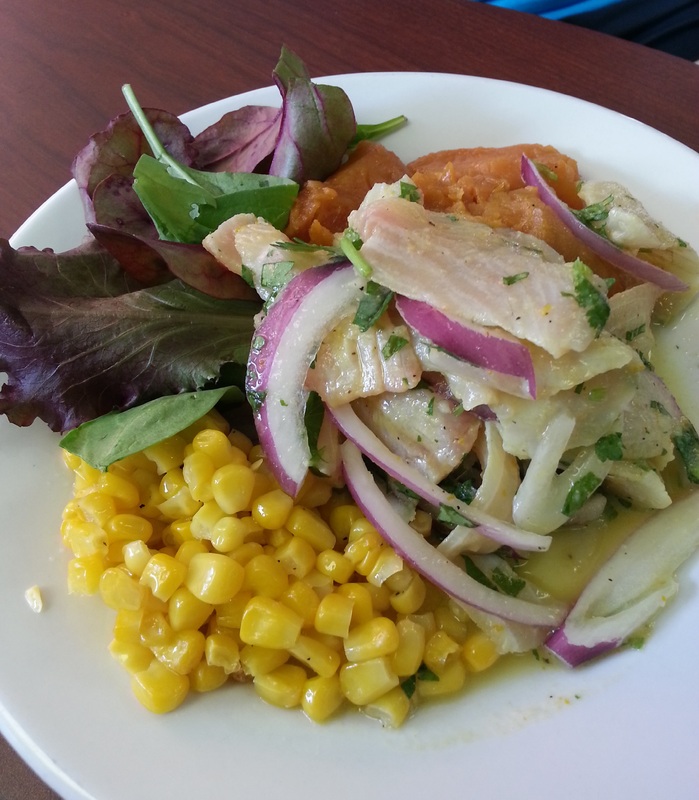 Si Señor’s ceviche is accompanied by traditional ceviche supporting stars: corn, sweet potato, and the salsa criolla described below. Ceviche is not the only non-sandwich offering either. Many days Si Señor will offer as a special some other traditional Peruvian dish. I’ve seen aji de gallina, papa rellena, and lomo saltado all offered from time to time. They also have well-seasoned meat empanadas, which are filled with ground beef, onions, and raisins. Dusted with powdered sugar, these good-sized pastries are a steal at only $3.50. But. Back to the sandwiches. 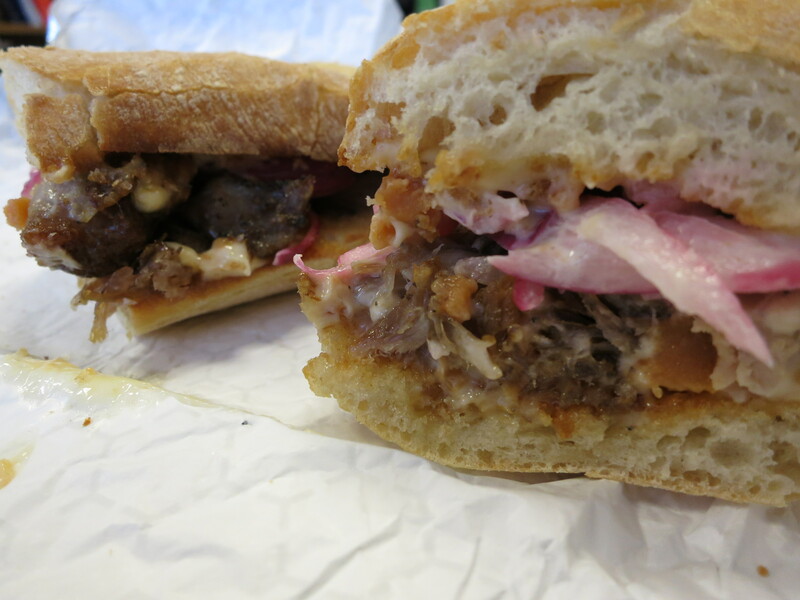 For my money (and they’ve gotten plenty of it), the best sandwich on the menu is the Chicharrón Peruano. A classic Peruvian sandwich, the Chicharrón Peruano consists of pork shoulder that has been cooked slowly and in such a way that it actually ends up frying in its own fat. The result is a meat that is crispy and can be quite crunchy on the outside while remaining tender and juicy on the inside. The sandwich is then topped with salsa criolla. Salsa criolla is best described as an onion relish, and it’s found in numerous Peruvian dishes. (For those of you afraid of the ceviche as described above, try the salsa criolla. While not the same, the flavors are similar enough to give you an idea of what you’re missing.) It’s generally prepared by marinating red onions in a combination of lime juice and vinegar. The result is a delightfully tangy flavor that helps balance out the richness of the pork. Si Señor puts its own twist on the traditional combination of pork and salsa criolla by dressing the sandwich with a sweet potato mayo. Having eaten my fair share of chicharrón sandwiches at Si Señor, it was my goal to have at least one while in Peru to see how our locals stacked up to the authentic version. In what I presumed would be a match-up unfair to Si Señor, I visited T’Anta, a restaurant operated by the world-renowned Gaston Acurio. (Gaston Acurio can best be described as a celebrity chef and international Peruvian icon. His flagship restaurant Astrid y Gaston was recently named one of the top 50 restaurants in the world.) So, when I decided to compare Si Señor’s chicharrón sandwich to that of his, I was setting the bar pretty high. Other favorites of mine include any of the options built on a foundation of their oven roasted turkey and their take on a meatloaf sandwich—kicked up with the addition of chorizo and poblano peppers. Recently I’ve been enjoying the Latin-style chicken club a lot as well. In addition to the variety of flavors provided by the assortment of toppings (which include jalapenos, bacon, cheese, and avocado mayo) the chicken itself is seasoned to make sure it stands out from the rest of the sandwich. And stand out it does. The chicken is flavorful and juicy. As a whole, the sandwich just works, and works well. I’d also be remiss in not mentioning their “spicy sauce” and encouraging you to say “yes” when asked if you want some. In Peru, almost every restaurant has one or more aji sauces sitting out on the table. So the spicy sauce at Si Señor fits into that cultural tradition. In our travels we had good and bad aji, and I can say Si Señor’s version is one of the best. Be forewarned, it actually is spicy. They’re telling the truth. 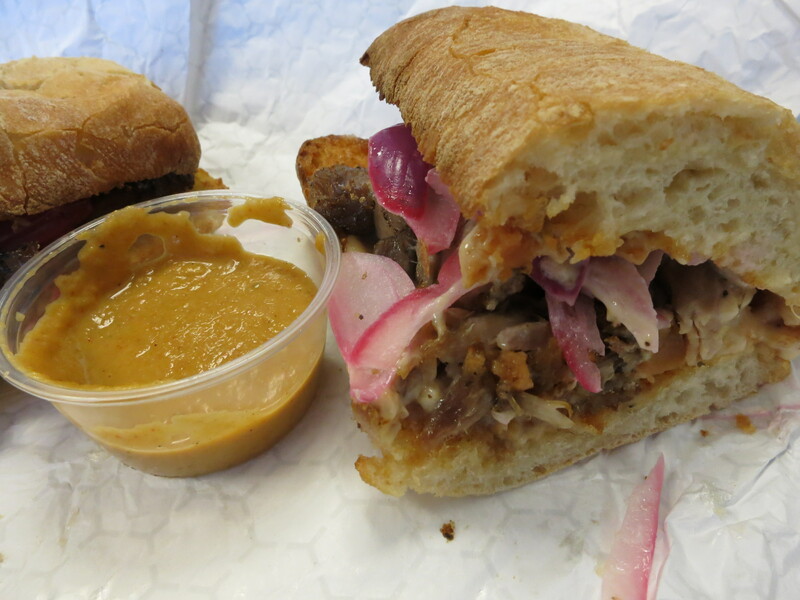 Chicharrón sandwich with a side of spicy sauce. 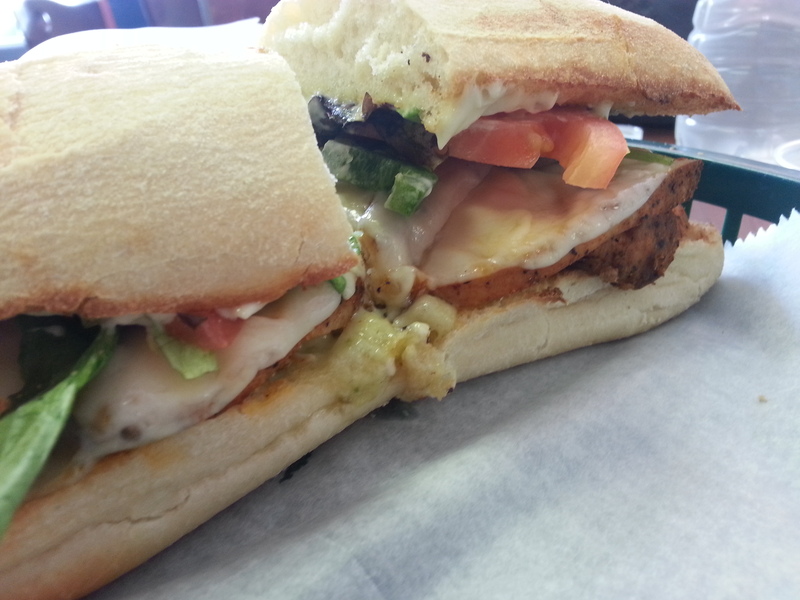 At the end of the day, the sandwiches at Si Señor are one of the best, if not the best, option for lunch downtown. And that’s without accounting for the fact that they’re an incredibly good deal. Priced around $6 (give or take $0.75 or so), the value you get is unbelievable. The ingredients they use are of the highest quality, and everything is made fresh when you order it. (The one result is that when they get busy, you may have to wait before your order is ready.) It’s incredibly obvious that Si Señor takes great pride in putting out a top-notch product; the quality is apparent from the first bite. Along the lines of “value,” their combo meal is worth mentioning. For just an extra $1.50 you have the option of adding a drink and chips. At least, that’s what the menu says. What you really have the option of is chips—or one of any number of other things, including pasta salad, a small portion of one of the high-quality salads on the menu, or a cup of soup if it’s available that day. Let me say this: there is no good reason to get the chips. All of your other options are so delicious, that you’ll be missing out otherwise. 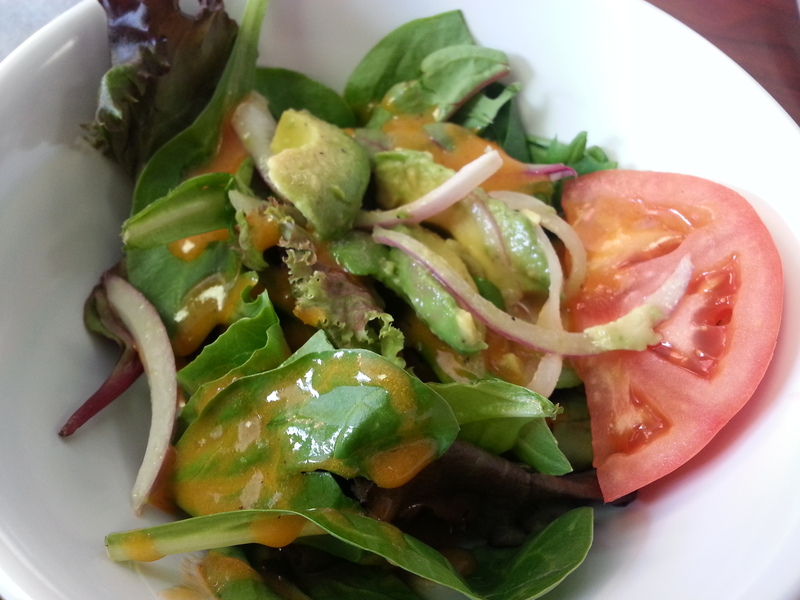 Avocado salad — one of may side dish offerings. As can be seen, I highly recommend visiting Si Señor next time you’re looking for lunch downtown. And you’ll probably need to go back on a Saturday afternoon as well. Otherwise, you’ll never know what you’re missing with respect to their incredible ceviche.